“Scorched” is an epic, international mystery that has captivated and stunned audiences around the globe. After their mother’s death, twins Janine and Simon, guided by letters their mother has left each, travel to the Middle East to untangle family roots entwined in a war-ravaged past. A play of raw power and poetic resonance, the Syracuse Stage production marks the return of director Marcela Lorca (“Caroline, or Change”). 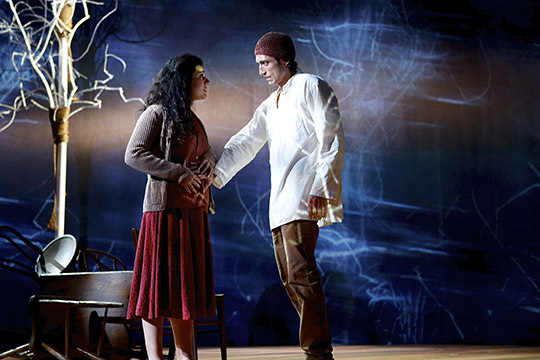 Nadine Malouf (Nawal) and René Millán (Wahab/Nihad) in the Syracuse Stage production of Scorched. “Scorched” performs through Nov. 10 in the Archbold Theatre at the Syracuse Stage/Drama Complex. It is recommended for mature audiences due to adult language and violent situations. Tickets can be purchased online at http://www.SyracuseStage.org, by phone at 315-443-3275 or in person at the Syracuse Stage Box Office at 820 E. Genesee St. Discounts are available for groups of 10 or more at 315-443-9844. Pre- and post-show events include the Opening Night Party (Oct. 25 with live music by Freres Jumeaux—brothers Eric and Anthony playing pop song covers on cello and violin), Happy Hour (Oct. 31 with half price drinks and complimentary snacks), an Actor Talkback (following the 7 p.m. show on Nov. 3), Wednesday @ 1 Lecture (“Creating Complex Stories about the Arab World” with Professor Carol Fadda-Conrey), and Prologues (moderated discussions with actors from the show on Oct. 27, Nov. 2 and Nov. 7). Visit Syracuse Stage Events for more info. Additionally, two discussions are planned during the run of “Scorched.” A panel discussion called “Listening to Scorched: Women, War and Resistance” will take place on Oct. 26 at 6 p.m. in the Storch Theatre at the Syracuse Stage/Drama Complex. The discussion will be moderated by Fadda-Conrey, joined by Professors Dana Olwan (SU), Neelika Jayawardane (SUNY Oswego) and Aisha Musa (Colgate University). This event is sponsored by the SU Humanities Center in The College of Arts and Sciences, organizer of the 2013 Syracuse Symposium: Listening. A second discussion will feature David Harrington of Kronos Quartet and Alex Ross from The New Yorker, at 1:15 p.m. on Saturday, Nov. 2, in the Sutton Pavilion at the Syracuse Stage/Drama Complex. Kronos is the only recipient of both the Polar Music Prize and the Avery Fisher Prize, two of the most prestigious awards given to musicians. In Scorched, selections from the Quartet’s recordings will serve as transitional music, made possible with support from SU Arts Engage. In writing Scorched, playwright Wajdi Mouawad drew inspiration from personal experiences as well as Greek tragedies and Kafka. Nawal, the central character, was partly inspired by a woman the playwright had met, who had attempted to assassinate the commander of the South Lebanon Army in 1988 and was interned in the army’s notorious El-Khiam prison for 10 years (CBCNews). “Scorched” was originally written in French under the title “Incendies,” which was adapted into a film that received an Academy Award nomination in 2011. The Syracuse Stage production of “Scorched” features a cast of nine: Kenya Brome (Sawda/Elhame), Soraya Broukhim (Janine/Jihane), Philip Hernández (Ralph/Malak/Chamseddine), Leopold Lowe (Antoine/Militiaman/Janitor/The Man), Dorien Makhloghi (Simon/Guide), Nadine Malouf (Nawal), René Millán (Wahab/Nihad), Tuck Milligan (Alphonse Lebel/Doctor) and Socorro Santiago (Nawal 2/Nazira/Abdessamad). Designers of the production are John Arnone (scenic designer), Paul Tazewell (costume designer), Christopher Akerlind (lighting designer) and Jonathan R. Herter (sound designer). Digital imagery is by Austin Switser. The stage manager is Laura Jane Collins.